Cricketer Murali Vijay Welcomes His New Born Baby..! India Test opener Murali Vijay and his wife Nikita on Monday announced the arrival of their third child on micro-blogging site Twitter. Murali Vijay, a regular in the test side, last appeared for India in the test series against Australia last year. For long he has been sidelined due to an injury. He is expected to play in the Ranji Trophy for Tamil Nadu before the South Africa series gets underway. He was part of the team that had a brilliant home run in tests last year, where India won 11 test matches out of 13, losing one and drawing one. Although he has struggled to find a place in the limited overs sides, Vijay is India’s first choice opener in Test cricket. He last played for India in their Test series against Australia. He had been slated to play in the Indian Premier League 2017 but was one of the many Indian players ruled out due to injuries from the long home Test season that preceded the tournament. Indian batsman Murali Vijay announced that he and wife Nikita welcomed a child on Monday. 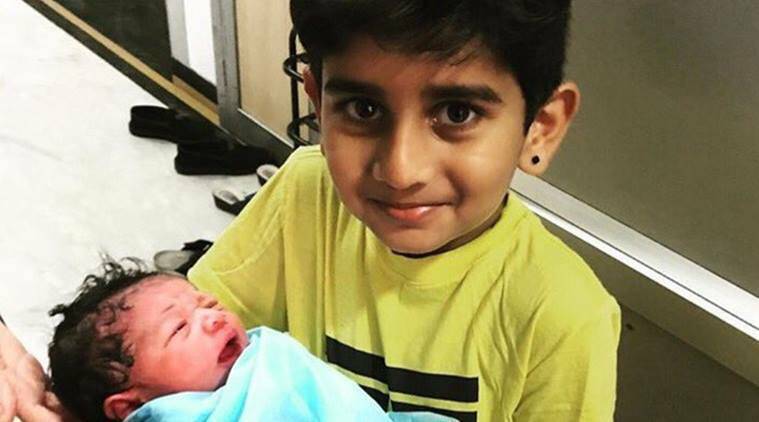 Vijay uploaded an image with his eldest son holding the newborn in his hands. “Two Rockstars!! One introducing the other to the world. Feeling Blessed,” said the Test opener in his caption. Vijay has two more children – a son and a daughter – with Nikita, who he married in 2012. Because he was still recuperating from the injury, he did not make an appearance in India’s Test series in Sri Lanka. Shikhar Dhawan was chosen instead and the Delhi batsman scored centuries in both Tests that he played. He is now expected to play for India when they embark on a tour of South Africa before which he will play for Tamil Nadu in the Ranji Trophy opener. Nicknamed ‘Monk,’ Murali Vijay is known to possess a calm head on his shoulders and has been integral to India’s recent success in Test cricket that has seen them remain no. 1 in the ICC rankings since they hosted New Zealand in 2016. He and KL Rahul formed a formidable opening pair for India when they subsequently hosted England for a five match series, a one-off Test against Bangladesh and a four-match series against Australia. He is expected to be back in the Indian squad for Sri Lanka series and in all certainty will travel to South Africa.